Masquerade masks are for more than carnival season. Masks are great for Halloween- not just to wear, but also to decorate with. To inspire you, here are a few Halloween decorating ideas using masks in creative ways. If you want to create similar Halloween decorations, find these masks and similar styles at MardiGrasOutlet.com. Add a note of mystery to your ghostly creatures with masks. The black cat eye mask on this cute mesh ghost (featured above) adds another touch of whimsy to the decoration. We will post a DIY tutorial for creating this mesh ghost next week. Look for it soon! 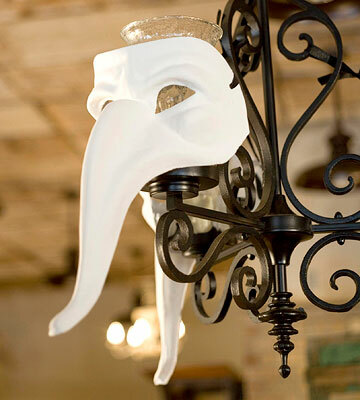 A paper mache Stallion mask adds a spooky accent on a chandelier, sconce or candle holder. Better Homes and Gardens featured Spooky Stylish Halloween Decorations that lend a sinister effect to a light by attaching an eerie mask. The light will glow through the eyes of the mask, giving off a mysterious glow. 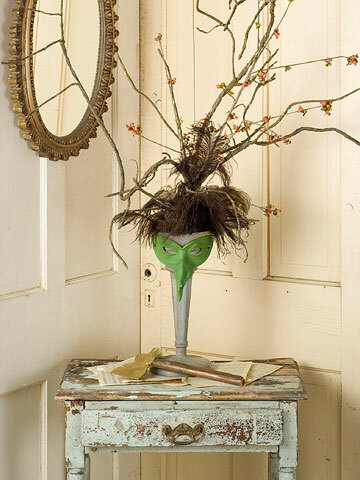 Transform a tall vase into a witch head by filling the vase with branches and feathers. Tie them at the top to create the illusion of a pointy hat. Adorn the vase with a green mask for the witch face. 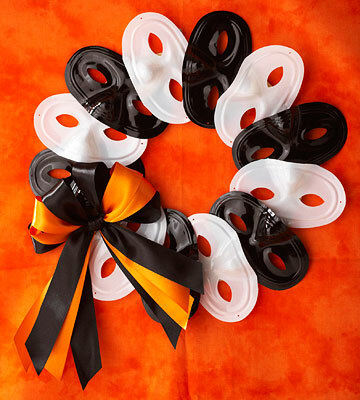 Craft a striking Halloween wreath by hot-gluing alternating black and white domino eye masks to a wreath form. The striking combination of black and white mask creates a fun, inexpensive and unique Halloween themed wreath. Photo credit : Spell-binding black and white Halloween decorations at BHG.com. What a fun and easy way to add a new look to your jack-o-lantern! Slip a mask on your pumpkin face to change him from plain to perfect! These cute Jack-o-lanterns were featured in Good House Keeping, Magical Halloween Decorating Ideas. A pumpkin carving party for your friends and family is lots of fun. Have a contest for the best pumpkin creation. If your guest don't want to carve at the party, offer fun masks and accessories to decorate their pumpkin and they can carve the pumpkin later at home. After the party everyone gets to take home their pumpkin creation- the perfect party favor! What better way to disguise yourself at a costume party than with Mustaches and Masks? This precious centerpiece was featured on Hostess with the Mostess blog for a Victorian themed Halloween party. The masks and mustaches are anchored in a big silver wine cooler with orange candy. This arrangement serves not only as a centerpiece, but also as party favors. Cute idea! A gold venetian mask lends a air of mystery to this elegant Halloween table-scape. The metallic gold adds a nice luster to the black and white color scheme.